Hurrah! Finally had time to get the AS3935 lightning detector working! And it took some time…. With all these hot days over the last week there have been a few thunder storms. So the mission was to try and capture one with the new module to see if it really works. 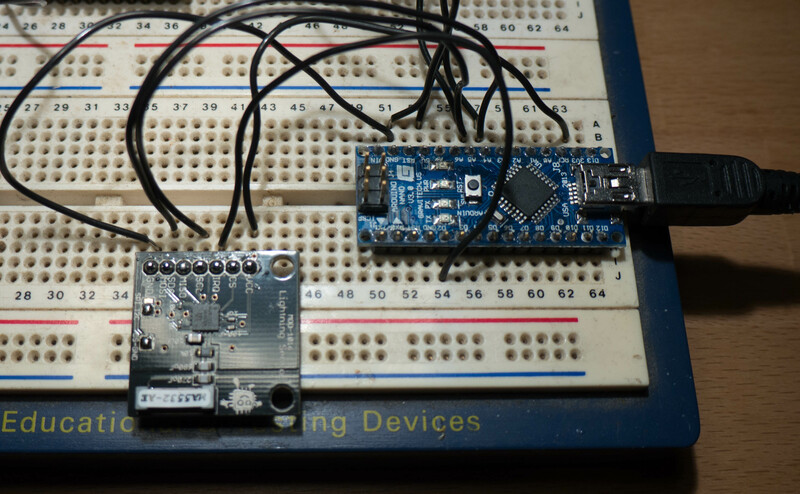 The main difference between the Embedded Adventures module and the ones that have come before is this one defaults to using I2C rather than SPI. 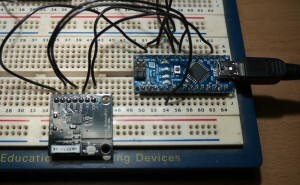 There are a number of Arduino libraries for this chip but only SloMusti’s supports I2C. This library does not use the stock Wire I2C library so you also have to download Rambo’s I2C library. So wired it all up to my Arduino Nano that lives in my breadboard… not a lot happened! First gotcha, the embedded adventures board has the I2C address hard wired as 0x03. So quick change to the example code and all looked better. It appears there are some issues using the AS3935 chip in I2C mode with the default address of 0x00. I didn’t actually think that was a valid I2C address… never mind! Oh the joys of errata sheets. Well… I can see the clouds flashing outside the window, I can hear the distant rumbles and the Isle if Wight live storm data showed there were about 100 strikes a minute within a 60 mile radius. I live about 20 miles north of their site so I should have been detecting. Nope! Did some searching, saw people testing it with a piezo sparker so grabbed my blowtorch and clicked away… nothing. GRR!! Its 1am on a friday night so tired and fuzzy so went to bed a little pissed off. I’d been powering it from 5V as the datasheet for the board stated 2.4-5.5V. Hmm… Flipped the power wire from the 5V to 3.3V, plugged the Nano into my PC, clicked the sparker on my blowtorch and BINGO! It registered as a ‘disturber’. Basically a signal that was generated by a spark but not real lightning. So epic relief that the board was not a duffer, extreme annoyance that I’d missed a good storm and a bit of frustration that this chip appears to be more errata than datasheet. I see why the Tautic board was SPI. Next job: convert the AS3935 library to use the Wire I2C and to allow direct writing of a known calibration value to the chip. Also I need to look at the Wire library supplied with the generic STM32 Arduino support. It looks like it is bitbashed. Need to get it using the hardware I2C interfaces on the Cortex M3 STM32. Much faster and a lot less CPU time needed. Previous PostTruly silly module!Next PostBatteries.. not that reliable?